In order to take a racial substitution level you need to already be a member of that race. So you couldn't take it at 1st level. I believe the bard cloaker is suposed to replace the first level of bard, not cloaker. Trade weapon and armor proefeciencies for improving your moans while geting started on the bard class itself. -Please clarify on the entry how natural-rapiers work (can be enchanted, cannot make iteratives, no penalty for attacking with both). It's an obscure mechanic and players shouldn't need to to go dig trough the MM and DMG to figure out how they work. -On the repairs matter, since craft can aparently be used, I would say 1 GP worth of materials and a craft check with DC 15 repairs one hit point as a fullround action. Also check the Inevitable's "rebuild" option. -Hmm, seems you're right about the skill points thingy. Updated the Inevitable then. I have added explanations of how its weapons work as well as given it the option to detach them to use like normal rapiers. I have also added two repair options, one is emergency healing the other is overnight healing. -Put CL=HD for SLAs please, for standardization's sake. -The same for tripping thrust. HD, not character level. -Reflect only works against ranged touch attacks? -You can drop your SR as a free action. Do you still need to spend a standard action to put it back up? Clarify it just to be safe. -Do you need to use deflect and reflect before or after you know if your entropic shield stoped an attack? Otherwise, really like your custom special abilities! Keep up the good work! -It DID. I made it work against all ranged attacks instead. Originally I couldn't imagine reflecting an arrow fired from 300 feet away at the person who shot it. Then I said "Melee deserves nice things" so I gave him the ability to turn any ranged attack back assuming he make the attack roll and has the AoO to spare. -I have edited in that information. You declare you're using after you know whether they overcame your miss chance, but before you know whether they're going to hit anyway. That way his abilities aren't self-defeating. I also added a new special ability "Like Water" which lets the Nimblewright move around more. I have also added to the parry special ability to make the Beat special quality more useful (Since disarming is looked down upon). I think he's done though. I will polish the language here and there if someone points out a flaw, and I could think of new special abilities all day long, but that's more support than is merited by a 7-level class. Better to have him complete and usable, so I think edits will be limited to fixing typos and faulty language from now on. The only major edit I can think of would be to give it an "advance to large size" option at level 16, but since the class is only 7 levels that seems out of tune with most published materials. What action does it take to detach and re-attach them? You left a typo there, "lower or lower". Looks good as well. Can you use it multiple times on your own turn? I don't think it needs a large size option. Just take care of the last typos and clarifications and it should be ready for the Index! Prime32: Don't see any more problem with the cloaker, so will add it to the Index. Congratulations on your first monster class! I must say, I'm a big fan of this thread. I do have one request, will YOU please redo the beholder? A wizard of the same level can be more of a beholder than a beholder and I don't think that's right. Half Black Ice Golems|Heal from Cold damage. Half Cannon Golems|Heal from Fire damage. Half Chalk Golems|Heal from Cold damage. Half Diamond Golems|Heal from Repair/Cure* spells. Half Dragonbone Golems|Heal from negative energy damage. Half Dung Golems|Heal from Fire damage. Half Elder Eidolon Golems|Heal from negative energy damage. Half Emerald Golems|Heal from Acid damage. Half Glass Golems|Heal from Fire damage. Half Hard Wood Golems|Heal from Cold damage. Half Lemorian Golems|Heal from Fire damage. Half Maggot Golems|Heal from negative energy damage. Half Obah-Blessed Clay Golems|Heal from Acid damage. Half Relief Golems|Heal from Cold damage. Half Ruby Golems|Heal from FireFire damage. Half Rune Golems|Heal from Cold damage. Half Serpentflesh Golems|Heal from Electricity damage. Half Shaboath Golems|Heal from Cold damage. Half Swarm Golems|Heal from Cold damage. Half Tellene Bone Golems|Heal from negative energy damage. Half Tellene Bronze Golems|Heal from Electricity damage. Half Tellene Ice Golems|Heal from Cold damage. Half Thayan Golems|Heal from Cold damage. Half Topiary Guardian Golems|Heal from Cold damage. Half Watcher Clay Golems|Heal from Cold damage. + Force damage heals 1 point of damage for every 4 points damage it would normally have done to the Half-Golem. Black Ice-This material is carved from ice exposed to negative energy and great blocks of frozen blood. The Half Black Ice Golem's Constitution improves by an extra +2 and its Natural armor increases to equal its constitution modifier. Any creature that damages the Half Black Ice Golem with a melee attack suffers 1d4 cold damage per 4 HD the Half Black Ice Golem has. Cannon -Chalk-This material is crafted from a wire cast covered in a thick chalky powder mixed with paste and other adhesives. The chalk dust is loose and easily airborne, leaving a trail of thick white powder behind the Chalk golem. The Half Chalk Golem may elect to leave lose dust as it moves or not as a non-action. While doing so any square that the Half Chalk Golem moves through is left filled in a white dusty powder that raises 5 feet off the ground. The dusty cloud obscures all sight, including darkvision, beyond 5 feet. A creature 5 feet away has concealment (attacks have a 20% miss chance). Creatures farther away have total concealment (50% miss chance, and the attacker cannot use sight to locate the target). A moderate wind (11+ mph), such as from a gust of windDiamond-Dragonbone-This material is crafted from the carefully reconstructed skeletal components of a mighty dragon, and is animated with the bound spirit of the very beast. The Half Dragonbone Golem's Strength improves by an extra +2 and its natural armor increases to equal its constitution modifier. In addition, when the Half Dragonbone Golem gains Damage Reduction at 2nd level, it gains DR Adamantine and Bludgeoning. Drakestone-Dung-Elder Eidolon-This material is carved from ancient stones covered in runes and glyphs from forgotten, dead languages. The otherworldly geometry of this material makes it difficult to graft, increasing the Will save DC of The Danger Ritual by 5. The Half Elder Eidolon Golem gains Fast Healing equal to half its HD. Further the Half Eidolon Golem gains a deflection bonus to armor class equal to its Strength bonus. Emerald-Glass-Hard Wood-Ironwyrm-This material is forged from Iron ores that have been marinated in the blood of dragons, and is animated by the same trapped and unwilling spirit of a recently departed creature. The half Ironwyrm Golem's Strength improves by an extra +2 and its natural armor increases to equal its constitution modifier. In addition, the Half Ironwyrm Golem is immune to spells that normally effect metals or other specific materials, such as rusting attacks or Heat Metal spells. Lemorian-Maggot-Obah-Blessed Clay-This material offers extra momentum to the Half Obah-Blessed Clay Golem. After it has engaged in at least one round of combat the Half Clay Golem can act as if it were under the effects of Haste. Activating this ability is a free-action, and lasts 1 round per HD and can be used once per day plus an extra use for every 4 HD the Half Obah-Blessed Clay Golem has. In addition, when the Half Obah-Blessed Clay Golem gains Damage Reduction at 2nd level, it gains DR Adamantine and Bludgeoning. Relief-Ruby-Rune-Sardorian -This material is taken from a red crystalline statue carved in the image of a great and powerful dragon, deep within the material a pulsing light creates an ominous red glow. The Half Sardorian Golem gains an addition +2 bonus its Strength Score and its natural armor bonus increases to equal its constitution modifier. Further when a Half Sardorian Golem gains Magic Resistance at third level it gains Power Resistance rather than Spell Resistance, and this Power Resistance is increased by its constitution modifier. Even in a game with transparency the Half Sardorian Golem only adds its constitution modifier when resisting psionic abilities. Further the Half Sardorian Golem gains a racial bonus to its jump checks equal to its HD. Serpentflesh-This material is composed of the body parts of various Scaled Ones, stitched together to resemble a fairly humanoid limb. The Half Serpentflesh Golem's Dexterity improves by an extra +2 and its Natural armor increases to equal its constitution modifier. Further the Half Serpentflesh Golem is adept at displacing and replacing its bones to get through small spaces, the Half Serpentlesh Golem gains a racial bonus on Escape Artist checks equal to its HD. Shaboath-concealment while underwater. Further a Half Shaboath Golem gains a racial bonus on swim checks equal to its Hit Dice. Swarm-This material is composed of an army of figurines carved from stone, granting the Half Swarm Golem incredible control over its body and resistance against sharper weapons. The Half Swarm Golem gains an additional +2 Dexterity, and its natural armor bonus increases to equal its constitution modifier. In addition, when the Half Swarm Golem gains Damage Reduction at 2nd level, it gains DR Adamantine and Bludgeoning. Tellene Bone-Tellene Bronze-Tellene Ice-This material is formed by freezing negatively charged blood and water around a humanoid skeleton, and draws on dark frozen energies. The Half Tellene Ice Golem's Constitution improves by an extra +2 and its Natural armor increases to equal its constitution modifier. Any creature that damages the Half Tellene Ice Golem suffers 1d4 cold damage per 4 HD the Half Tellene Ice Golem has. Thayan-magic missiles spells or effects. Could you be a little more specific please? Saying that something is weaker than a wizard is probably true, but isn't very precise. Edited it to explicitly state you can use it multiple times, the use that requires you to sacrifice an AoO is a free action on your turn so it can be used as many times as you have AoOs, and the one that you use on someone else's turn is an immediate action so you have to weigh whether you want to give up your swift action or not. Also fixed the typo. Thanks for looking over all of it. You probably noticed I'm not exactly very keen on spammable spells, even with some kind of "recharge" system. But you're right the Beholder's class kinda has too few uses of it's SLAs, when it's suposed to be his main stick. How about this: Lords of Madness states that Beholders actually get their power from draining magic energy from the enviroment. Their central eye isn't exactly nullifying magic, but actualy sucking it. So I give the beholder some more uses per day of the rays, and then allow the Beholder's central eye to "absorb" magic from whatever it affects. Buffs will get dispelled, enemy spell slots will be lost, magic items will stop working for some time, and the beholder will drink them to recharge his own eye rays and keep blasting. How does that sound? Bloody Initiate:Great! Will add it to the index then! Congratulations as well on your first monster class! 60 ft. to special qualities. Okay, after checking my copy of Monsters of Faerun the cloaker lord is pretty nuts. It's a CR 7 monster that casts as a 9th-level wizard. Wha? Anyway, here's a rough draft. The standard cloaker is a CR 5 monster with 6 HD, while the cloaker lord has 9HD. I went for a 3-level class to spread out the benefits a little. On Deep Magic... I used a non-SRD feat, but included a substitute for players without access to it (a la the Kalashtars' mindlink). It's not exactly the same as the original feat. The advanced spell access makes up for forcing you take 5 levels in another class, and is just enough to get access to 9th-level spells by 20th level. I figure the 11+HD Spell Resistance is unnecessary, especially since they can just eat a cloak that provides it. I wanted to do something about the fluff ability of the head cloaker lords to merge into an orb called the Conclave of Shadows, but I can't think of any way to use that in a party which doesn't consist entirely of choker lords. EDIT: Huh... just noticed that the cloaker lords' natural weapons go from 1d6/1d4 to 2d6/2d4 from only one size increase. Okay, after checking my copy of Monsters of Faerun the cloaker lord is pretty nuts. It's a CR 7 monster than casts as a 9th-level wizard. Wha? Yeah, that would be one of the monsters that needs to be hit with the nerfbat. Oh, and they ignore all non-vocal components. How come I had never heard of this lovely monster before? Deep Magic: A cloaker lord can prepare and cast arcane spells as a Wizard of its class level +2 (stacking with any wizard levels it gains). So it starts casting as a wizard 3 by default, and can reach 9th level spells at lv 20? Very nicely done. So it cannot learn extra spells correct? Why this one? The original cloaker lord doesn't have it. The monster actually says it's specialized in spells with the shaddow subschool, wich granted, isn't very clear. Ok, perhaps best to just give it SWM. Cloaks of spell resistance are seriously overpriced. I would give the cloaker lord SR at 2nd level, since blindfight and +10 flight speed aren't exactly that hot. Wouldn't be that usefull anyway. Quickly reaching conclusions is pretty much a default PC ability anyway even if the DM insists they shouldn't be able to stop to discuss strategy mid-battle. EDIT: Huh... just noticed that the cloaker lords' natural weapons go from 1d6/1d4 to 1d6/2d4. Improved Natural Attack would just overly complicate things though. Remember that around here we assume that natural weapons damage increase with size by default. Now to revise a beholder. The 3.5 revision handbook is also pretty crazy. Take a look at the revised hairy spider, for example. It's given a LA of +0. It's also [mindless]. Class Skills: (4+ Int Mod.) x4 at first level. a beholders class Skills are appraise, bluff, concentration, decipher script, hide, intimidate, knowledge (arcana), Knowledge (dungeoneering), Knowledge (the planes), move silently, search, spellcraft, spot. Proficiencies: The beholder is proficient with no armor or shields and is only proficient with its own natural weapons. Eye of the Beholder: The beholder loses all racial features and gains aberration traits (basically darkvision 60 feet). A beholder is a medium sized aberration whitout a land speed but can hover above the ground at a speed of 20ft to a maximum hight of 5ft at 1st level. The maximum height increases by an addition 5ft for every 2 HD the beholder possesses. Because of this the beholder ignores all damage from falling any distance. Beholders do not possess limbs capable of fine manipulation of wielding conventional weapons; however the beholder does have a bite attack that deal 2d4 + Str Mod Damage. Additionally, the beholder receives a bonus to its natural armor equal to either his Int or Cha modifier, wichever is higher..
Tyrant Magic: A beholder who multi-classes into an arcane casting class can count his beholder levels as levels of that class for purposes of CL and for the purposes of learning new spells and getting new spell slots. So for example, a beholder 3 who took 1 level of wizard could choose to have CL 4, get 3 [2nd] level spell slots, 1 [1st] level spell slot, 1 [2nd] level spell known and 1 [0th] level spell known. He wouldn't get the spells known and spell slots of a wizard 3 however. He would get the familiar ability, but beholder levels wouldn't count for it. Gaze of Slumber (Su): When a beholder is born, it begins life with a single eye stalk capable of firing a ray that Lulls its target into slumber. This ray (and all other eye rays possessed by the beholder) have maximum range of 10ft per beholder level. The beholder must succeed on a ranged tough attack, if the attack is successful the target is allowed a will save (DC = 10 + 1/2 HD + Charisma Modifier) or he fall asleep. The effect of this ray is identical to that of a sleep spell with a caster level equal to the beholder's HD, except that it has no limit on the number of HD it can affect. The beholder can use this ability twice a day for every HD it possesses. Ability Increases: A beholder receives a permanent increase to its Constitution scores at 1st, 5th, 9th, and 13th, level. And bonuses to his charisma and intleggence score at 3rd, 7th, and 11th levels. These bonuses total to +3 Int, +3 Cha and +4 Con at 13th level. Gaze of Charming (Su): As the beholder grows, it begins to sprout addition, more powerful eye stalks. at 2nd level the beholder grows an eye capable of firing a ray which can charm a human or humanoid into becoming more friendly with the beholder. If the beholder succeeds on a ranged touch attack, then the target must succeed on a will save (DC = 10 + 1/2 HD + Charisma Modifier) or become charmed as per the charm person spell with a caster level equal to the beholder's HD. The beholder can use this ability once a day for every HD it possesses. Gaze of Fear (Su): At 3rd level the beholder grows a new eye stalk capable of firing a ray which instills emotions of dread, panic, and fear in the target. If the beholder succeeds on a raged touch attack, then the target is entitled to a will save (DC = 10 + 1/2 HD + Charisma Modifier) or be a effected by the fear spell, caster level equal to the beholders HD. The beholder can use this ability once a day for every HD it possesses. Gaze of Pain (Su): At 4th level the beholder grows another eye stalk capable of firing a ray of pure negative energy to damage their foes. If the beholder succeeds on the attack, the target must succeed on a will save (DC = 10 + 1/2 HD + Charisma Modifier) or be affected as if by a Inflict Moderate Wounds Spell with a caster level equal to the beholders HD. The beholder may use this ability once a day for every HD it possesses. Bonus Feat: At 4th level the beholders growing arcane knowledge enables him to alter his eye rays in varying ways. At each even numbered level beginning at 4th, he may choose any one metamagic feat he meets the requirements for (the beholder treats his HD as his caster level for the purpose of determining which prerequisites he meets). Metamagic the beholder gains may be used to augment the spell his eye ray mimics as though it were actually being cast. Though the spell the eye ray is mimicking must still be eligable to be affected by the metamagic. Using any metamagic feat to augment the spell uses up a number of uses of that eye ray equal to the number of levels that would be added to the spell level. Eye rays are already considered stilled and silenced, so those two would be pointless. Omnigaze (Ex): The bizarre brain structure of a beholder allows him to intemperate visual signals from varying angles and positions as well as coordinate his eyes to take advantage of this. The most useful aspect of this ability is that it allows him to coordinate his eye rays efficiently so that he can optimally use many simultaneously. As a full-round action a beholder can fire any and all eye rays it possesses though it may only fire up to 3 separate eye rays in any 90 degree arc. Each eye ray fired may have different targets. Each eye ray may only be fired to a maximum of 1/round. Gaze of Encumbrance (Su): At 5th level, a beholder grows another eye stalk. This eye stalk is capable of firing a ray which inhibits the targets movements and causes him to move more sluggishly. If the beholder succeeds on the attack, then the target must a make a Will save (DC = 10 + 1/2 HD + Charisma Modifier) or become Slowed as per the spell. The caster level for this effect is equal to the beholder's HD. The beholder may use this ability once a day for every HD it possesses. Anti-magic Eye (Su): At 6th level, the beholder's central eye has finally matured to the point to where it can fire brief bursts of energy that suppress magical effects and abilities. The beholder activates this ability opening its central eye, this requires a move equivalent action that does not provoke an attack of opportunity. This ability takes the form of a cone which extend 10ft for every HD that the beholder Possesses (Maximum 150 ft.) everything caught in the cone is effected as if caught in the area of a dispel magic spell with a caster level equal to the beholder's HD. This ability can be used a maximum of once every 2d4 rounds. After each use the beholder must close its eye to allow the magical energies of the eye to recharge. For every spell dispelled or countered this way, the Beholder can recover one use of one of his eye-stalks wich replicates a spell of same level or lower. All Around Vision (Ex): The beholder's eye stalks have grown in the form a crown, he can now see in all direction simultaneously granting him a +4 to all spot and search checks. In addition, the beholder can no longer be flanked. Growth: the beholder's body has reached physical maturity and becomes larger. At 6th level, the beholder increases one size category. Gaze of Charm, Greater (Su): at 7th level, the beholder grows another eye stalk. this eye is much like his eye of charm person but instead works on any creature targeted, not just humans and humanoids. the beholder may use this ability once a day for every 2 HD it possesses. Buyouant: At 8th level the beholder's body reaches it's physical pinnacle. It has no limit to how high it can fly, and now adds both his Cha and Int scores to Nat armor. Gaze of Force (Su): At ninth level, the beholder grows another eye stalk. This eye is capable of firing a ray of pure mental energy, allowing him to exert his will over physical creatures and objects. This eye allows the beholder to use Telekinesis with a caster level equal to the beholder's HD. Creatures are allowed will saves (DC = 10 + 1/2 HD + Charisma Modifier) to resist the effect. The beholder may use this ability once a day for every HD it possesses. Greater Anti-magic Eye (Su): The power of the beholder's central eye increases. Creatures and objects inside the cone are now affected as if within the radius of a Greater Dispel Magic spell, it can be activated as a swift action, and only needs to wait 1d4 rounds between uses. The beholder still recovers eye-stalk uses for every spell dispelled/countered this way as before. In adition, spellcasters and creatures with SLAs caught in the radius must make a Will save (DC 10+1/2HD+Cha mod) or lose one of their highest level prepared spells/spell slots/SLA uses. If the target has two of more of those options, it loses the highest-level one. If it has multiple tied for higher level, it chooses wich one is lost. If it would lose an use of an at-will SLA, then it can use that SLA only once per HD for the next 24 hours. Either way, the Beholder recovers the use of one of his eye-stalks replicating a spell of the same level or lower. Omega Gaze: At 10th level the beholder can use his omni-gaze as a standard action, but then he must wait 1d4 turns before using it again. Gaze of Petrification (Su): At eleventh level the beholder grows on of his most powerful eye stalks, a ray capable of transforming almost any living creature into stone. If the beholder succeeds on the ranged touch attack then the target must succeed on a Fort save (DC = 10 + 1/2 HD + Charisma Modifier) or be petrified as per the spell Flesh to Stone with a caster level equal to the beholder's HD. The beholder may use this ability once a day for every 2 HD it possesses. Gaze of Destruction (Su): Arguably the beholder's most powerful weapon in it's arsenal, the beholders 9th eye stalk is capable of firing a ray of pure destructive energy. This eye stalk fires a ray which exactly duplicates the effects of a disintegrate spell, Fort save with DC = 10 + 1/2 HD + Charisma Modifier, with a caster level equal to the beholders HD. The beholder may use this ability once a day for every 2 HD it possesses. Gaze of Death (Su): The final eye stalk gained by the beholder is capable of firing a ray which drains the very life force from its targets. If the beholder succeeds on the ranged attack, then the target must must make a Fort save or be instantly stricken dead as per the Finger of Death spell. This ability has a caster level equal to the beholder's HD and can be used once a day for every 3 Hd the beholder Possesses. Gaze of the Eye Tyrant (Su): The powerful eye of the beholder has finally reach its pinnacle. The area within the cone is now affected as if by an antimagic field as per the spell. The caster level for this effect is equal to the beholder's HD. Additionally, the effect remains active constantly as long as the beholder's central eye is open and no longer requires regular periods of recharge, neither does the eye affects the beholder himself (altough targets). The beholder can close or open his eye once per turn as a free action. In adition, as a swift action the Beholder may strenghten of his central eye in order to drain the mystical energies from his oponents. This works exactly as the Greater Anti-Magic Eye ability, except that it works on the creatures under the antimagic field cone. This can dispell supressed magics, ending them for good. The beholder also now counts as true beholder-kin. Only now. So no beholder-mage shenigans before you get the 13 levels. 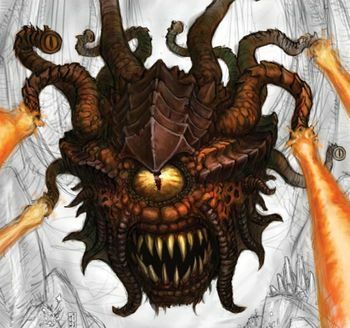 Ah, the beholder, a truly classic D&D monster. And in the hands of a skilled DM, one of the few able to face a whole party by itself thanks to being able to shoot multiple attacks per round. Great for a boss battle, not so great for a player's hands. Like most other monsters here the beholder has his SLAs limited to X/day, but since it exceptionally is heavily based on it's SLAs (otherwise it's a floating head whitout that good combat stats), I allowed it to "drink" magic energy from his oponents to recharge his own powers. Casters beware, this beholder's central eye not only supresses your powers, it also dispells your buffs while sucking your precious high level spell uses! Also drains other monster's SLAs. Shooting the rays as free actions is pretty ridiculous, so the beholder class gets omnigaze (fullround action, can't move) and omega gaze (standard action, has cooldown). Finally wizard/sorceror sinergy, so you can make a beholder mage whitout need of the prc if you want. It does not require a spellbook, but receives the benefits of Spell Mastery for every spell it knows. Like a bard, its spells always have verbal components. That was... not my intention. It's more like it uses its own body as a spellbook, since it can't turn pages. I meant to add something about having to pay the normal costs to "scribe" spells. Huh, I had a typo. Let me clarify. The MM cloaker is a Large creature with natural weapons dealing 1d6 and 1d4 damage respectively. Since my class starts at Medium I reduced the damage by one size so that Growth would scale it back up. The cloaker lord is a Huge creature with natural weapons dealing 2d6 and 2d4 damage respectively. i.e. it's only one size larger but its weapons deal damage as two sizes larger. I sugest that they can use their sonic abilities to ressonate with a special kind of (expensive but market-available) crystal in order to "engrave" them with new spells, then attach said crystals to their own bodies. Totally didn't make that up just now. Don't understimate the first level of wizard! That innocent scribe scroll feat and summon familiar can be traded for all kind of juicy things. Hmm... what about a "shadow core" within their body which is the source of their cloaker lord abilities, and can also be used as a spellbook? If you kill a cloaker you can loot the core while you're cutting it open for cloaks, though it's a little harder to understand than a conventional spellbook (+4 Spellcraft DC). 2 Skill points+int per level, quadruple at 1st level. Class skills: Concentration, Climb, Diplomacy, Disguise, Heal, Hide, Spot, Listen, Move Silently, Bluff, Intimidate, Knowledge(any), Search, Spellcraft, Swim. Dragon Body: At 1st level of this class the Gold Dragon loses all racial bonus and gains dragon traits. It is a Medium Dragon, 2 claws doing 1d6 + 1/2 Str modifier, a bite doing 1d8 + Str modifier damage and a base speed of 40 foot. The claws are capable of fine manipulation. The gold dragon also has a natural armor bonus equal to his Con modifier. Whenever the gold dragon grows a size category his Natural armor increases by an extra +1. The gold dragon is immune to fire but takes +50% damage from cold attacks. Alternate Form (Su): A Gold dragon can assume any animal or humanoid form of Medium size or smaller as a standard action 1/day for each HD it has. The dragon can remain in its animal or humanoid form until it chooses to assume a new one or return to its natural form. Fire Breath: 30 ft cone of fire as a standard action. Fire does 1d6/level damage, Reflex DC 10+1/2 HD+Con modifier halves. Once used must wait 1d4 rounds before using again. Keen senses: The Gold Dragon sees four times as well as a human in shadowy illumination and twice as well in normal light. It also has darkvision out to 120 feet. Arcane Blood:A gold dragon receives spells known and spells per day as a sorceror of 2/3 his level, but he has CL equal to his HD. The gold dragon may choose to learn spells from the cleric spell list instead of the sorceror/wizard list. That choice must be made when this ability is gained and can't be changed afterwards. Swimming: The Wings of the Gold Dragon can be used to propel the Gold Dragon through water giving it a swim speed equal to its base speed. It can swim on the surface or below it without difficulty. It moves through water without making Swim checks. It has a +8 racial bonus on any Swim check to perform some special action or avoid a hazard. It can always can choose to take 10 on a Swim check, even if distracted or endangered. It can use the run action while swimming, provided it swims in a straight line. So at 20 level it has +8 Str, +7 Con, +6 Cha. Amphibious (Ex): This dragon can breathe underwater indefinitely and can freely use its breath weapon, spells, and other abilities while submerged. Wings: At 4th level the Gold Dragon can fly at a speed of 10 ft/HD with poor maneuverability. Wings can be used to attack, doing 1d4 + Str damage. Bless:At 5th level the gold dragon can use Bless as a SLA 1/day for each 5 HD it has. Weakening Gas: At 5th level the gold dragon gains a new breath weapon, same area as fire breath, but instead of damage creatures within a cone of weakening gas must succeed on a Fortitude save DC 10+1/2 HD+Con modifier or take 1 point of Strength damage per 2 HD of the dragon. Must wait 1d4 rounds before using again. Parley: At 8th level a gold dragon gains a bonus on Diplomacy and Intimidate checks equal to half its HD. Detect gems: At 9th level, the gold dragon can detect gems 1/day for every 3 HD it has. This is a divination effect similar to a detect magic spell, except that it finds only gems. The dragon can scan a 60-degree arc each round: By concentrating for 1 round it knows if there are any gems within the arc; 2 rounds of concentration reveal the exact number of gems; and 3 rounds reveal their exact location, type, and value. This ability is the equivalent of a 2nd-level spell. Domain: At levels 10 and 18 the gold dragon can add the spells from one domain to his spells known list. The choices are Law, Luck, and Good. Luck:Arcane skin: At 11th level the gold dragon gains SR equal to his HD+11. Iron Scales:At 12th level the gold dragon gains DR/magic equal to half his HD. Golden Speed: Gold Dragons are always quick to the rescue. At 13th level the gold dragon base speed increases by 10 feet, and an aditional 10 foot at 17 HD and every 4 HD thereafter. In addition the Gold Dragon may now turn itself into the target of an attack directed to an ally whitin its reach as an Immediate action. Frightfull presence:Crush:Judgement: At 15th level Geas/Quest SLA as the spell useable 1/day for every 5 HD, except it has only a casting time of one standard action. Fate: At 16th level, the gold dragon gains a sacred bonus to AC, skills and saves against attacks from oponents that the golden dragon has taken no harmfull actions against equal to 1/4 his HD. Sunburst: At 17th level, SLA as the spell, useable 1/day for every 5 HD, save DC 10+1/2 HD+Cha modifier. Answer Fate: At 19th level, 1/day per 5 HD, the golden dragon can cast any number of spells and SLAs on himself as a standard action. Foresight: At 20th level, SLA as the spell, useable 1/day for every 6 HD. The gold dragon is suposed to be the strongest metalic dragon, so it gets a whooping +8 str. Behind the red dragon yes, but the gold dragon gets powerfull SLAs, alternate form and swim speed in return. Wich brings us to the point that one thing I've missed is that metalic dragons can get cleric spells. So I added this option to the golden dragon (you still only get to pick one list tough) and later on the class you get to add domains. Unfortenely for the golden dragon he only grows to gargantuan at 21 CR so it stays just huge pre-epic. Anyway the gold dragon ends up as a powerfull tank/support gish, able to buff his allies while weakening the oposition. If you want a big "bad" metallic dragon the gold one is for you. Black Ice- The Half Black Ice Golem, as a free action 1/minute, can spray shards of negatively charged ice from its body filling a 10 foot cone in front of the Half Ice Golem, plus 5 feet for every 3 HD. Any creature caught in the spray suffers 1d4 damage per HD, Reflex DC (10+1/2 HD+ Constitution Modifier) for half. Half of this damage is half negative energy damage, the other half is cold damage. Further any creature damaged by this spray of shards must make a Fortitude save DC (10+1/2 HD+ Constitution Modifier) or suffer 1d3 negative levels for the following 1d4+1 rounds, these negative levels fade away at the end of the 1d4+1 round duration and do not last long enough to become permanent. Cannon -Chalk-Diamond-Targeted Dispel MagicDragonbone- Drakestone - The Half Drakestone Golem gains a petrifying breath weapon. As a free action, 1/minute, the Half Drakestone Golem may launch a petrifying breath attack. This attack spreads out to a 10 foot cone in front of the Half Drakestone Golem, plus 5 feet for every 3 HD it has. This cone deals 2d4 Dexterity damage. This damage increases by one size category every 4 HD the Half Drakestone Golem has. The targeted creature is allowed a Fortitude save DC (10+1/2 HD+ Constitution Modifier), for half damage. Should the target be reduced to 0 Dexterity in this manner they become petrified, as per Flesh to StoneDung-Elder Eidolon- The Half Elder Eidolon Golem gains an additional slam attack, further when the Half Elder Eidolon Golem attacks with its slam attack, it inspires insanity in all creatures within 30 feet that have fewer Hit Dice than it has, such creatures must succeed at a Will save (10+ 1/2 HD+ Strength Modifier) or suffer from the confused condition for 1d4 rounds per 2 HD of the Half Elder Eidolon Golem. A successful save leaves that opponent immune to this insanity effect for 24 hours. Emerald-Glass-Hard Wood-Ironwyrm-PrototypeLemorian- The Half Lemorian Golem gains reach of 5 extra feet with its slam attack, as well as Improved Grab, allowing it to initiate a grapple on a successful slam attack without having to make a touch attack or provoke an attack of opportunity. On a successful grapple check, the Half Lemorian Golem deals constriction damage equal to its slam damage. Further the Half Lemorian Golem is extremely talented at doing two things at once. If the Half Lemorian elects to use its extended slam attack to hold its opponent rather than moving into its square an initiating a proper grapple, is suffers only a -10 penalty on the grapple checks, but the Half Lemorian Golem is not considered grappled itself; and does not lose its Dexterity bonus to AC, it continues to threaten an area, and can use its remaining attacks against other opponents. Maggot-Obah-Blessed Clay- The Half Obah-Blessed Clay Golem gains a second slam natural attack and an additional functioning arm, which may wield a weapon, manipulate objects, or behave otherwise like an arm. Upon Reaching 5, 10, and 15 Hit Dice the Half Obah-Blessed Clay Golem gains an additional slam attack and another functioning arm. Relief-Ruby-Rune- As a free action, 1/Minute, the Half Rune Golem can launch an explosion of eldritch energy and splinters from its body. This fills a 10 foot cone in front of the Half Rune Golem, plus 5 feet for every HD it has. Creatures within the area are bombarded with various splinters, which deals 1d4 piercing damage per HD of the Half Rune Golem to any creature or object in the area. A DC (10+ 1/2 HD+ Wisdom Modifier) Reflex save reduces this damage to half. Further any creature damaged by these splinters is marked with several Runes, and must make a Fortitude save DC (10+ 1/2 HD + Wisdom Modifier) or suffer from the blinded condition for 1d4+1 rounds. The Rune remains after this duration and behaves as an Arcane Mark. Sardorian- The Half Sardorian Golem gains a powerful breath weapon that is a mixture of is a mixture of force and brilliant light. As a free action, 1/Minute, the Half Sardorian Golem may release a cone of destructive energy which fills a 10 foot cone in front of the Half Sardorian Golem, plus 5 feet for every 3 HD the Half Ironwyrm Golem has. Any creature caught in this breath weapon cone suffers 1d4 points of Force damage per HD the Half Sardorian Golem has, Reflex DC (10+1/2 HD+Charisma Modifier) for half. Further any creature damaged by this breath weapon must make a Reflex save of the same DC or be blinded for 1d4 rounds. Serpentflesh- The Half Serpentflesh Golem gains a venomous barb, allowing it to inflict poison with its slam attack. An opponent damaged by its slam attack is subjected to potent poison with a DC (10+1/2 HD+Constitution Modifier) Fortitude save that deals and an initial and secondary damage of 1d6 Strength damage. This damage increases by one size category every 4 HD the Half Serpentflesh Golem has. At 10 HD even creatures immune to it can be affected but they gain a +5 bonus on their saves. Shaboath- The Half Shaboath Golem gains reach of 5 extra feet with its oozy blue pseudopods-like slam attack. It also gains Improved Grab, allowing it to initiate a grapple on a successful slam attack without having to make a touch attack or provoke an attack of opportunity. On a successful grapple check, the Half Shaboath Golem deals constriction damage equal to its slam damage. Further, the Half Shaboath Golem may use Wall of Ice as a spell like ability once per day, plus one additional time per day per 4 Hit Dice it has. Its caster level is equal to its Hit Dice. Swarm-Tellene Bone-Tellene Bronze- The Half Tellene Bronze Golem gains a scalding steam breath attack. As a free action, once per minute, the Half Tellene Bronze Golem may breathe out a cloud of heated steam which fills a 10-foot cone in front of the Half Tellene Bronze Golem, plus 5 feet for every 3 HD the Half Tellene Bronze Golem has. Any creature caught in this steaming cone suffers 1d6 fire damage per HD the Half Tellene Bronze Golem has, Reflex DC (10+1/2 HD+ Constitution Modifier) for half. A creature damaged by this ability must make a successful Reflex save of the same DC or suffer half the amount of fire damage dealt on the following round on their turn. This fire effect functions underwater without penalty. 4 Skill points+int per level, quadruple at 1st level. Class skills: Appraise, Bluff, Concentration, Diplomacy, Disguise, Handle Animal, Intimidate, Knowledge (Any), Listen, Search, Spot, Survival, Swim. Proficiencies: A Bronze Dragon isn't proficient with any armor or weapons, besides its own natural weapons. Bronze Dragon Body: The bronze dragon loses all other racial bonuses gaining Dragon traits (including darkvision 60' and immunity to paralysis & sleep), with one bite as a primary natural attack dealing 1d8+str, as well as 2 claws as secondary natural attacks dealing 1d6+1/2 str damage each, 40' base speed, swim speed equal to its base speed and is medium sized. The bronze dragon has wings, but they're too weak to do anything for now. His claws are capable of fine manipulation and can be used for somatic components of spellcasting or anything else a human hand could do. The bronze dragon also gets a natural armor bonus equal to his Con modifier. Whenever the bronze dragon grows one size category, his natural armor increases by a further 1. The bronze dragon is immune to electrecity. It has no particular vulnerability. Alternate Form (Su): A bronze dragon can assume any animal or humanoid form of Medium size or smaller as a standard action 1/day for each HD it has. The dragon can remain in its animal or humanoid form until it chooses to assume a new one or return to its natural form. Lightning Breath: As a standard action no more than once every 1d4 rounds, the Bronze dragon may breathe out a line of lightning out to 60', plus 10' per class level. It deals 1d6 damage/HD, with a reflex save (10+1/2 HD+Con Mod) for half. Keen senses: At 2nd level, the bronze dragon sees four times as well as a human in shadowy illumination and twice as well in normal light. It also has darkvision out to 120 feet. Arcane Blood:A bronze dragon receives spells known and spells per day as a sorceror of 2/3 his level, but he has CL equal to his HD. The bronze dragon may choose to learn spells from the cleric spell list instead of the sorceror/wizard list. That choice must be made when this ability is gained and can't be changed afterwards. Blindsense: As the srd ability, 60 foot range. Ability score increase: The bronze dragon gains permanent bonus to his ability scores as the following table. For a total of +7 Str, +7 Con and +6 Cha at 20th level. Wings:At level 4 the Bronze dragon becomes able to fly with a speed of 10' per HD, with poor maneuverability. The maneuverability doesn't increase naturally, but players can take the Savage Species feat that increases it by two steps(stackable). Each wing can also be now used to deliver a secondary natural attack dealing 1d4+1/2 str damage. Amphibious (Ex): At 3rd level this dragon can breathe underwater indefinitely and can freely use its breath weapon, spells, and other abilities while submerged. Bronze Dragon SLAs: At 3rd level the bronze dragon can now use Create Food and Water and Fog Cloud as SLAs 1/day for every HD it has. At 5th level it can use Detect Toughts and Speak with Animals 1/day per HD. Save DCs 10+1/2 HD+Cha mod. Repulsion Breath:At 6th level, instead of the line of lightning the Bronze dragon may breath out a cone of repulsion gas out to 30', plus 5' per class level. Those caught in the blast must make a will save (DC 10+1/2 HD+Cha Mod) or be forced to do nothing but move away from the dragon for 1d6 rounds. This increases to 2d6 rounds at level 6 and by another 1d6 every 3 levels thereafter, up to 6d6 at level 18. This is a mind affecting compulsion effect. It must then wait 1d4 rounds before using it again. Bronze Empathy: Gained at 7th level, works as the Druid Wild Empathy ability, but using the full HD of the Bronze Dragon for the check, and can be performed as a standard action whitout penalties, even in magic beasts. The range is also 10 feet per HD instead of just 30 feet. Control Water:At 8th level as an SLA, once per day/5 HD, save DC 10+1/2 HD+Cha mod. Growth:At 9th level the Bronze dragon grows to large size. At 15th level the Bronze dragon grows to huge size. Tail slap:The Bronze dragon can now make a tail slap attack dealing 1d8 damage (already taking in acount large size). This is a natural secondary attack. Domain: At levels 10 and 18 the bronze dragon can add the spells from one domain to his spells known list. The choices are Animal, Law, and Water. Arcane skin: Starting at 11th level, the Bronze dragon gains SR equal to his HD+11. Iron Scales: Starting at 12th level, the Bronze dragon gains DR/magic equal to half his HD. Rescue:At 13th level the Bronze Dragon can, as a fullround action, take two move actions and during them pick up any number of creatures whose combined weight doesn't put the dragon over a light load. The Bronze dragon can then drop those creatures at another point of his movement, or move them to his back at which point they count as riding the dragon. Rescue movement doesn't provoke attacks of oportunity. Wanderer:At 14th level the Bronze Dragon gains a bonus to Survival and Disguise checks equal to half his HD, plus the track feat. If it already has the track feat it may pick any other feat for which he meets the prerequisites. Frightful Presence:Crush:Protector: At 16th level creatures smaller than the bronze dragon adjacent (or riding it) get a sacred bonus to AC and saves equal to 1/4 the Bronze dragon's HD. Bronze Friendship: Unlike most other dragons bronze ones greatly enjoy the company of other beings. At 17th level, if a bronze dragon spends at least 8 hours in a day within view range of a creature which doesn't consider the bronze dragon an enemy, that creature counts as affected by a Greater Status effect as the spell, except that it extends to other planes, counts as an extraordinary effect, and has a permanent duration. A bronze dragon can have a number of bronze friends equal to his Cha mod. If it reaches the limit it may swap old friend for new ones. Bronze Unity: At 19th level, 1/day as a standard action the Bronze Dragon can rally his closest teammates with a mighty sense of companionship, camaredage and similar feelings. The Bronze Dragon and any adjacent bronze friends gain a friendship bonus to AC, Saves, Attack and Damage rolls equal to the number of bronze friends adjacent to the Bronze Dragon when this ability is used. This effect lasts for a number of rounds equal to the Bronze Dragon's Cha mod, but the affected creatures don't need to remain adjacent after it started. Change Weather: At 20th level the Bronze Dragon can use Control Weather as a SLA once per day/5 HD, except that the casting time is only one standard time. Save DCs are 10+1/2HD+Cha mod. The bronze dragon is specially connected to nature, with several water and animal related powers. It has better skills than the gold dragon in return for a little worse stats, and weaker SLAs in return for more variety. The extra breath weapon is also better as it targets will and takes oponents out of the battle. Plus no elemental vulnerability is always nice. The bronze dragon also seems less arrogant than the other so it gets several teamwork abilities. Rescue allows you to move around allies, and protector and bronze friendship help the dragon help others. Of course, geting too togheter will make you a tasty target for area effects. So if you want a more rangerish dragon that loves to work as a team, the bronze dragon's for you!